Indian Logistics Industry is said to be 13% of GDP. One can hear this figure in almost every intellectual discussion related to Logistics and infrastructure. Many are even unaware of where this figure comes from, this gets actively cited at various industry discussions, conferences and white papers and is interpreted differently by various ‘experts’. Poor state of Logistics in the country is a general inference after this citation. The confusion compounds when this gets linked to the transaction cost in Logistics so much so that one would find an executive in a price negotiation discussion citing this figure as if this is the basis of every transactional cost in Logistics. Many experts express their concerns over this cost being high in comparison to other countries and try discussing solutions by taking this as a benchmark cost. But is that a correct figure 1st and if at all, is that a right interpretation of this cost? Lets us look at constitution of GDP where Agriculture contributes 18.1% to GDP, Industry 26.3%, and services 55.6% etc. This tells us about the constitution of GDP where each individual sectors assumes a size as a share of GDP. Does Industry at 26.3% of GDP, tells up about the state of Industry in India? It primarily tells us about the size of Industrial sector in our country. Incidentally, Logistics encompasses all these sectors and if carved out as a separate constituent it’ll also show up as a %age in the GDP pie. That’s how the existing academic research work in logistics sector tends to aggregate total logistics cost and express them relative to some economic baseline, such as GDP. But that gives an idea of only the size of Logistics Industry in the country. And size does not automatically relate to performance i.e. bigger or smaller is better etc. The case of logistics adds to the confusion due to that fact that unlike many other sectors logistics assumes two roles in trade policy agenda ~ One is the trade in services of which logistics is considered a separate cluster for discussions and 2nd is trade facilitation where logistics is assumed to be facilitating the trade. While the 1st represents size of the sector and can be seen as %age of GDP but does not necessarily tells anything about its performance and hence its interpretation with respect to trade facilitation may not be correct. Now, lets us discuss about the composition of the Logistics cost deduced as 13% of GDP ~ how did one arrive at this cost 13% of GDP? With Logistics gaining importance around the globe, different studies have been conducted in different parts of world to establish a comparative number to it. The methodology to deduce this figure has gone through a kind of evolution. From a trade research point of view, the logistics costs can be measured or proxied through various approaches viz, as a %age of total firm cost, as a %age of GDP and using performance variable such as World Bank’s LPI. Regardless of which approach is taken to measurement, a key requirement for trade research focusing on logistics is the need for comparable data across a variety of countries and time periods. For most of the studies, so far, the data source used is either National Accounts data used by OECD member countries (ISIC Rev. 3 classification) or Input-Output data used by non OECD countries. The issue with these data sets is that industry classification in these data sets does not consider Logistics as a separate sector. Thus the building blocks which go into making Logistics Cost within these data sets are proxied. So many proxies need to be made in the data sets to deduce logistics cost and as a result, logistics cost has been defined in three scales in these data sets namely narrow, medium and broad. The narrow definition takes into account very specific segments related to Logistics captured in datasets whereas the broad definition takes into account the ancillary segments as well in addition. India being a non OECD country, the data taken to deduce the logistics cost in her case is based on Input-Output data of 2003-04 and the Logistics sector value added as a %age of GDP for India was calculated as 6.42% as per ‘narrow’ definition and 18.42% as a ‘broad’ definition. The big gap in numbers is confusing and indicates that there is a lot that has been included in the broader definition of Logistics with respect to data. And it is quite possible that lots of undesired data may have been included due to the structure of the data itself. Other leading researchers, in a paper published in 1999, computed the logistics cost for India and expressed it at 12.9% of GDP which is almost average of the values deduced from narrow, medium and broad definition of logistics as deduced from Input-Output data. So, this seems to be the basis of 13% Logistics cost. Though this number 13% (12.9%) is even disputed in academic circles as it seemed to have included data on passengers as well and considering that India a populous country, the passenger movement expenditure in India would be substantial hence the dispute seemed significant. 1st the number so far cited as %age of GDP has lots of questions marks as the datasets used to deduce the number has inherent structural problems. 2nd the number which appears as a %age of GDP is representative of the size of the sector, may assume relevance from a broader policy perspective but may not have much application to trade practitioners. 3rd, the number certainly is not to be seen as representative of the transactional costs. Transactional cost would vary from segment to segment, from industry to Industry and from company to company. 4th, this also does not mean that logistics cost in India is high or low, or logistics in India is efficient or not. This only points out that without identifying the micro issue of inefficiency, we may end up (largely, we actually do) employing solutions for issues which are not there and leaving the concurrent issue unresolved thereby damaging the supply chain further. 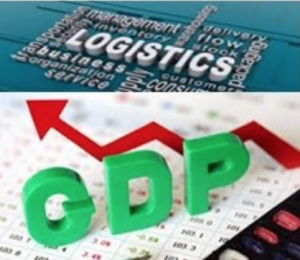 5th, a bigger number for Logistics cost as a %age of GDP is generally seen as an opportunity by the investors community largely with the perception that transactional costs exists at this level and can be brought down substantially. However, the opportunity is with respect to the size of the sector and exists in business models or macro infrastructural platform and not in transactions! Watch out this section for more on Logistics Cost and its various dimensions! Mansingh Jaswal is Founder Director & Chief Executive Officer of Genex Logistics (Genex LogiSolutions Pvt. Ltd.), having a professional experience of over 17 years in Supply Chain, Logistics, Transportation and International Freight and a Strategic Management Research Scholar at Management Development Institute (MDI).